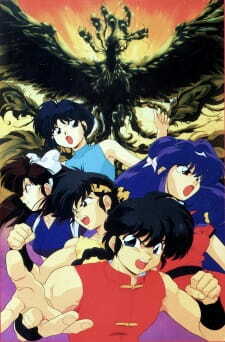 Prequel: Ranma ½: Kessen Tougenkyou! Hanayome wo Torimodose! This is my favourite of all the OVA story arcs because I believe it is truly the funniest. Seeing Kuno running around with a giant bird on his head really takes the cake and I'm sure this will be fun for everyone who views it! This particular OVA features my favourite OP theme of the series:"Where do we go from here? (You and me)" by DoCo. Poignant and catchy, "You and me", captures a very adult perspective of how difficult adolescent relationships can be. The ED,"Red Shoe Sunday" by DoCo,while not my favourite does have a pleasant melody and it's lyrics give some nice allusions to future relationships. I highly recommend this OVA, but further still, I recommend watching the OVA SET which has all of them.